During the 20th century there was a major decline in deaths from tuberculosis. This decline has never been satisfactorily explained but it must have been the result of an improvement of the general health and immunity of the population. In the years following the Second World War the decline continued, and antibiotic therapy in the form of streptomycin was introduced in 1952. The major clinical features of tuberculosis (TB) were cough productive of sputum, often with blood (haemoptysis), together with weight loss. This could go on for many years but it was often fatal. The course of the illness could be quite rapid. It was usually called “consumption”, meaning that the body was effectively “consumed” by the disease, what we would now call a malignant process. But with the decline of TB there remained a similar illness with a more rapid decline. This illness was characterised by cough, haemoptysis (coughing blood), weight loss, and deterioration. It was lung cancer, also known medically as carcinoma lung or carcinoma bronchus. The cause of TB had been identified by the great German pathologist Robert Koch as due to a micro-organism, Mycobacterium tuberculosis. Lung cancer was not obviously transmissible and its cause was not clear. Although cigarette-smoking was very common in the post-war years, there was a suspicion that it might be the cause of lung cancer. Further study was necessary but this was before the present era of medical statistics. The era was introduced by Sir Richard Doll and Sir Austin Bradford Hill. They understood the social variation of disease, that the poor had worse health and earlier death. It was necessary to “stratify” and study, that is to look at just one stratum or level of society. Doctors were chosen as the researchers had easy access to them. The “Doctors Study” became famous for identifying that lung cancer, in the vast majority of cases, is the result of smoking cigarettes. “Proof” is generally not understood but it will be defined in a future Post. In brief it means the fulfilment of predetermined criteria. At the present time we rely on the randomised controlled clinical trial. However this is not always possible and it would certainly not be possible to randomise a group of doctors so that half would have to smoke cigarettes and the other half not. The alternative was to use observational studies to demonstrate causation. Although these are not as powerful as the randomised control trial, of which the study of streptomycin was the first modern example, observational studies are usually the closest we can get to the truth. The application of observational studies was the specific role of the statistician Austin Bradford Hill and it was a great achievement of his (see future Post). Richard Doll dealt with the doctors and determined their pattern of cigarette smoking, the number of cigarettes smoked each day, if any. He then observed their ages of death and the causes of death. He was able to identify those who had died from lung cancer and the results are shown in Figure 1. It can be seen that people die with the passage of time. But the greater the number of cigarettes smoked each day, the higher was the mortality from lung cancer. In those over the age of 75 years almost 18% of heavy smokers died from lung cancer. It was just under 4.5% before the age of retirement. We can also see that a very small number of non-smokers over the age of 75 died from lung cancer, indicating that there must be other causes that are not of great numerical significance. There was a “dose-response” effect - the greater the number of cigarettes smoked each day the greater the likelihood of death from lung cancer. This is a very powerful indicator of causation as determined by Bradford Hill. The conclusion of the study was that cigarette smoking causes lung cancer. The study included deaths from coronary heart disease (CHD). At the time CHD had become a serious cause of death but its cause was far from clear, and that is still the case. Deaths of the doctors from CHD were also recorded year on year. By the 1950s death from coronary heart disease (CHD) had become a major problem but the epidemic had not yet reached its 1970 peak. There was concern that cigarette smoking might be the cause of CHD and the study of doctors gave a good opportunity for further research. As with lung cancer, the ages and causes of death of the doctors were recorded and deaths from CHD were identified. In both groups the causes of death were not robust as specific investigations were still in their infancy. The data was however the best available. The pattern of deaths from CHD, as shown in Figure 2, was very different from the lung cancer graphs. 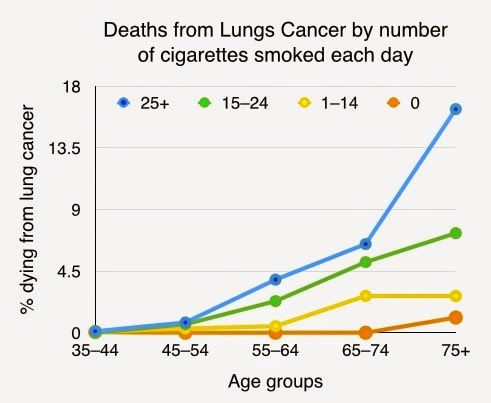 We can see that the graph lines run close together and there was not the separation seen in the lung cancer graphs. 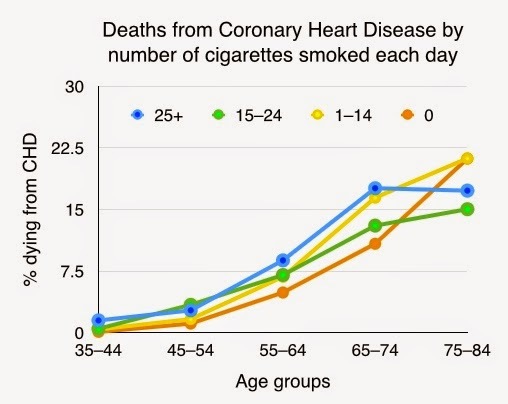 Above the age of 75 cigarette smoking had no influence on the likelihood of dying from CHD. In all smoking groups about 20% died from CHD. If we look at the age-group 55-64, we can see that heavy smokers had almost twice the deaths than non-smokers, 8.8% versus 4.9%. Again there was a “dose-response” relationship and it was concluded that cigarette smoking increases the risk of death from CHD in middle age. If we now look horizontal variation choosing a death risk of about 10%, we can see that this will occur at the age-group 55–64 in heavy smokers, but about ten years later in the age-group 65–74 in non-smokers. In other words if an individual is going to die from CHD, smoking cigarettes will bring death forward by up to ten years depending on the number of cigarettes smoked. We can conclude that cigarette smoking is bad and has an important and detrimental accelerating influence on CHD. However in view of the high death rate of non-smokers from CHD, we cannot conclude that cigarette smoking is “the cause”. Advice not to smoke is good advice. Found you via Seth Roberts. Great blog. Why is 1950's research wrt CHD and smoking relevant today when the CHD epidemic is almost over? Although 85% of heavy smokers don't die of lung cancer, the leading cause by far of lung cancer deaths is heavy lifetime smoking plus some unknown cofactor? You are correct that by far the most important cause of lung cancer is cigarette smoking. It is very rare in non-smokers. Also most heavy smokers do not develop lung cancer. The point is that cigarette smoking is bad for us but more dangerous for some than for others. Future posts should help with understanding of this. The end of the epidemic of CHD makes this aspect of cigarette smoking less relevant. However my main intention was to differentiate between "a cause" and "an accelerating factor", a general principle to help us understand the world around us. I was not aware of this work but on reflection it does not really surprise me. I appreciate that government and medicine are very much against smoking, perhaps because many people who smoke find it pleasurable. If so it must be dangerous and banned, like so many other pleasurable activities. It is interesting to search memories to days when smoking was acceptable, and also look at old photographs and films. Many "clever" people would smoke and smoke in particular when thinking and concentrating. This was particularly noticeable with smoking a pipe rather than cigarettes. It seemed to helping their thought processes. Perhaps it does have some beneficial effects. Pipe smoking (of which I have no personal experience other than observation) seemed to help people (more or less exclusively men) to relax. We seem to have a social problem now of overactive and troublesome young men. Perhaps pipe smoking would help them to relax, but this will not happen with the known biological damage inflicted by tobacco. I plotted the mortality sexratios by agegroups. a clear "peak-shifting" indicating that it depends on the year of birth. (many English men started smoking in WW1). This shift is almost absent for heart-deaths. Thank you for your kind comments. I hope you enjoy my other Blog Posts. Society must be careful about endeavors by the tobacco business to advance vapor e-liquid wholesale cigarettes as smoking is destructive to the wellbeing and can murder. We have a privilege to solid living by means of tobacco control and ought not be planning together furtively with the business.